Last weekend I finally bought, after months and months of deliberation, a new bike. Part of the problem was having a similar bike back in the UK- but the cost of shipping it was prohibitive. A tricky situation, since I have a hard time spending money. Why is that? Is it the Puritan ethic I was raised with? Is it me trying to save the world by minimizing my carbon footprint? Is it that I don’t want to consume any goods as that encourages little kids in Asia to work in sweat shops? Who knows. She’s a beauty. I name her- Talulah! It’s a Trek (Talulah the Trek) 7.3 FX, which means it has 7.3 different types of special effects- like cross-fade, fade-out, and bullet-time like in the Matrix. I can control them from a handset mounted on the handlebars. It cost a pretty penny- 72,000 yen for the bike, then gear cost another 50,000, which adds up to about $1,200, or 800 pounds. It’s expensive, but I think it’s a solid buy. Jason and I went for a 66km ride the day that I picked it up. We basically did a loop all round the city, up towards Saitama, round to the East and a park in Chiba by Tokyo Bay, then up through Ginza and Tokyo. It was good. Exhausting though. 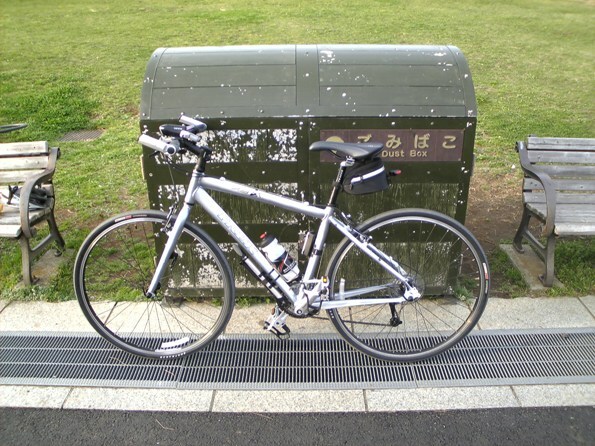 The ride down the Arakawa river was against a severe headwind. Very hard work- never getting any momentum. All the joy sucked out of going down hills, as the wind stole our inertia. We made it home around 6pm. 3 hours 10 minutes actual riding time. Maybe 5 hours for the whole journey. We didn’t stay in the park long- it was freezing down there with the wind off the ocean. Yes, a purchase long in the making! I hope we don’t have to battle a head-wind like that again anytime soon. Ah yes, that’s right, I’ll correct it. Wouldn’t want to get sued by anyone for printing any less than the truth. Accuracy should always be striven for. That is a really nice looking bike. Trek makes great bikes.